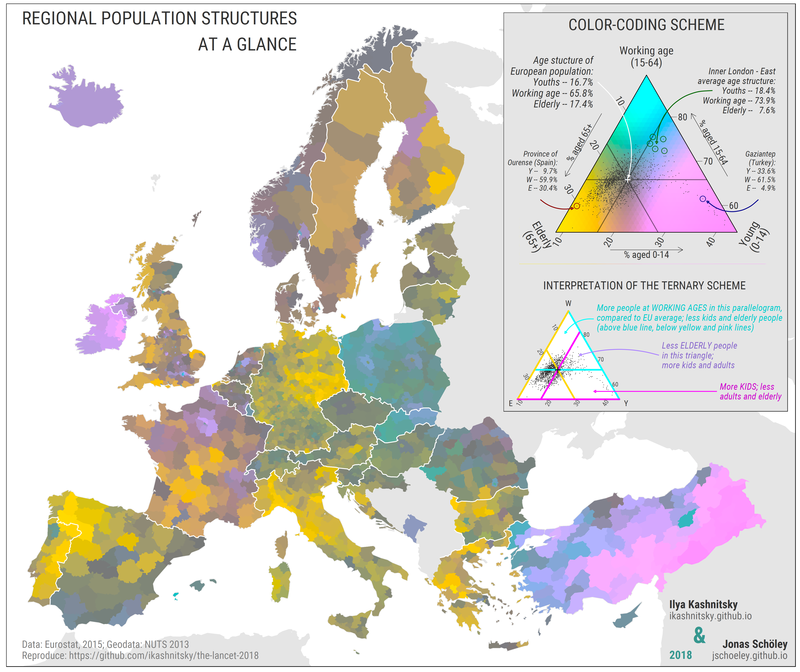 Using ternary colour coding and low-level administrative data Ilya Kashnitsky (NIDI) and Jonas Schöley (University of Southern Denmark) produced a detailed snapshot of the regional age structures across Europe. For each region the map shows the percentages of young, working-age and elderly population and how this composition compares to the European average. In this paper an innovative data visualization technique – ternary colour coding – was used in which the data speak colours. The authors use the technique to spotlight the issue of population ageing in Europe focusing on regional differences. Demographic history of a population is imprinted in its age structure. The map tells numerous demographic stories – at a glance. Reproducibility: Replication materials are on github. The paper can be easily reproduced in a couple of minutes using R.
Kashnitsky, I. & Schöley, J. (2018), Regional population structures at a glance The Lancet 392 (10143): 209-210.